Despite the hype (and paranoia) around it, retail on D-street remains a one-stock story—that of Pantaloon. There’s a palpable buzz in the retailing space. Apart from the big names of India Inc. who’ve entered the sector, foreign biggies, too, are looking for a piece of the action. With major players announcing huge expansion plans, the industry is all set to triple its size to 90 million square foot of retail space by 2009-10. It will touch a turnover of Rs 1,32,000 crore by then. Already, there are many big names in the retail business—Reliance, the Tatas, the Birlas, the Piramals and large home-grown retailers like Pantaloon Retail and Shoppers’ Stop. But behind the din and the hoopla, not many companies have managed to scale up their operations—and create shareholder value— like Pantaloon Retail has. Pantaloon had the first-mover advantage. 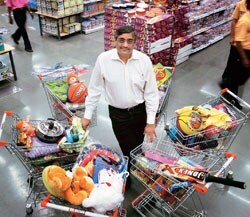 It saw the opportunity in organised retailing early and set up multiple format stores across the country. Now, the difference in scale, revenues and profitability between giant Pantaloon and the rest of the retail sector is astounding. Pantaloon is five times the size of its nearest competitor, and has a market capitalisation of Rs 10,315.1 crore (as on November 19, 2007) compared to Provogue India, which is valued at Rs 1,915.2 crore. But that’s expected of a store that operates more than 9 million sq. ft of retail space. It added 0.6 million sq. ft in October 2007 and has set a target of a total of 10 million sq. ft in 2008. What is it that makes Pantaloon tick on the stock markets? For an answer, look behind the cash counters. Pantaloon has multiple business formats from mass retailing to financing. The company operates stores in many different formats and has also forayed into Home Solutions, Future Bazaar and also has a retail financing arm, Future Capital. Analysts are considering the sum-of-the-parts valuation to fix a price on the company. Not many listed retailers have managed to scale up their operations like Pantaloon. Other retailers operating in the space are largely single-format companies that have one or two types of stores. TruMart, the food and grocery outlet of Piramyd Retail, plans to operate only two formats—largescale stores with areas ranging from 5,000-7,000 sq. ft, and smaller stores of about 2,000 sq. ft each. Others, such as Vishal Retail, cater to the mass market and sell products such as apparels and home products. Provogue operates in the lifestyle segment. But it’s the multiple format strategy that has made the company what it is. Over the last nine months, Pantaloon has doubled its market value to Rs 10,315 crore. Perhaps the only company that has come close to creating that kind of value is Titan Industries, which has a market capitalisation of Rs 6,724 crore. But it has a different business model, has invested in brand creation, and is largely operating through the franchise route, which keeps its overhead costs low. Across the retail industry, however, formats are still evolving as companies fine tune their strategies. Reliance Retail, for instance, has put its Reliance Fresh forays on the backburner following a political backlash in Uttar Pradesh and West Bengal and has forayed into the jewellery segment with Reliance Jewels. The Rs 64,600-crore organised retail segment currently accounts for about 5.3 per cent of the total retail pie in the country, and is set to grow at a fast clip on the back of massive investments in the segment and touch a turnover of Rs 1,32,000 crore by 2009-10, according to Ernst & Young (see Picking up the Pace). It is also expected to increase its share of the pie to 8.2 per cent by then. The Indo-American Chamber of Commerce estimates that the Indian organised retailing industry needs to invest Rs 3,00,000 crore over the next few years to realise its full potential.